FRAGRANCE PREP: Mix together the Anise Essential Oil and Orange 10X Essential Oil in a fragrance safe, glass container. Set aside. COLORANT PREP: In a small container, mix together 1 tsp. 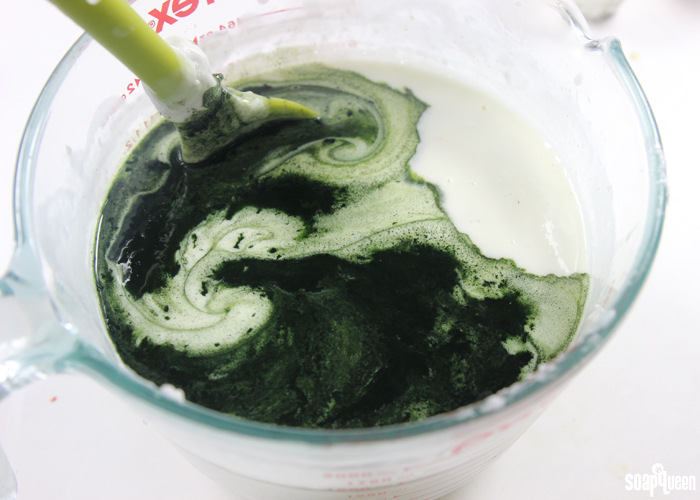 spirulina powder in 1 Tbs. 99% isopropyl alcohol. Use a spoon to mix and remove any clumps. In a separate container, mix together 2 tsp. green zeolite clay and 2 Tbs. 99% isopropyl alcohol and stir to remove any clumps. ONE: Chop and melt 50 oz. of Shea Melt and Pour in the microwave using 30 second bursts. Once completely melted, add the essential oil blend and use a spoon or spatula to stir in thoroughly. TWO: Add all of the dispersed green zeolite clay and 1 Tbs. of the dispersed spirulina powder. Thoroughly mix in the colorants until there are no clumps. THREE: Check the temperature of the soap. You want the soap to be around 120-130 ° F. If the soap is too hot when it’s poured into the mold, the majority of the clay will sink to the bottom. Pour the melted soap evenly into each mold cavity and spritz the top of the soap with rubbing alcohol to disperse any bubbles. Set the soap aside to allow to cool and harden. I love these silicone molds because they are so easy to release the soap from. 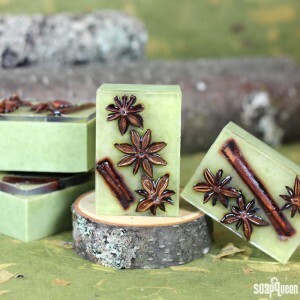 FOUR: Once the poured green soap has cooled enough to develop a thick skin, arrange the anise stars and cinnamon sticks on the top of each soap to your preference. Then, chop and melt 13 oz. of Clear Melt and Pour in the microwave using 20 second bursts. FIVE: Once the clear soap is completely melted and is no hotter than 130 ° F, spritz the top of each soap with rubbing alcohol, and carefully pour a thin layer of clear soap on the top of each mold. 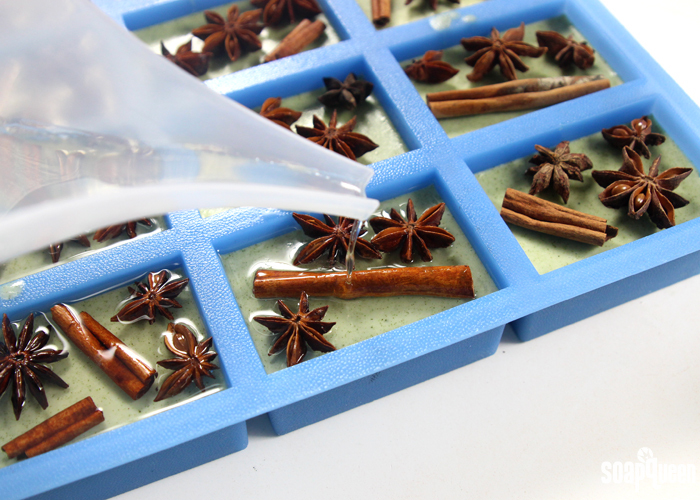 You want the clear soap to just cover the anise stars and cinnamon sticks. Immediately spritz with alcohol to disperse any bubbles. Repeat with all cavities and allow the soap to fully cool and harden. SIX: Once hardened, remove from the mold by pulling on the side of each cavity to break the airlock. Then, flip the mold over and press gently on the back of each cavity with your thumb or the palm of your hand until the soap releases. To prevent glycerin dew, wrap each soap in plastic wrap or another airtight container. 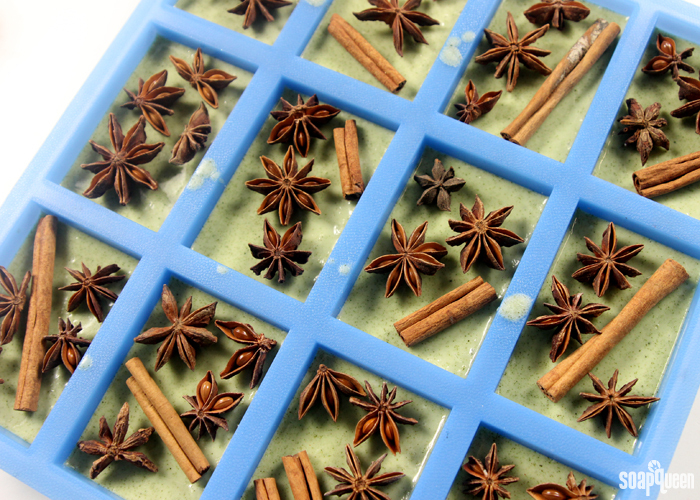 Wash carefully with each bar, as the anise stars can be a little poky. =) Because of this, you may prefer to use these as hand soap, or wash with the bottom side. What’s your favorite way to incorporate botanicals into your soapy projects? 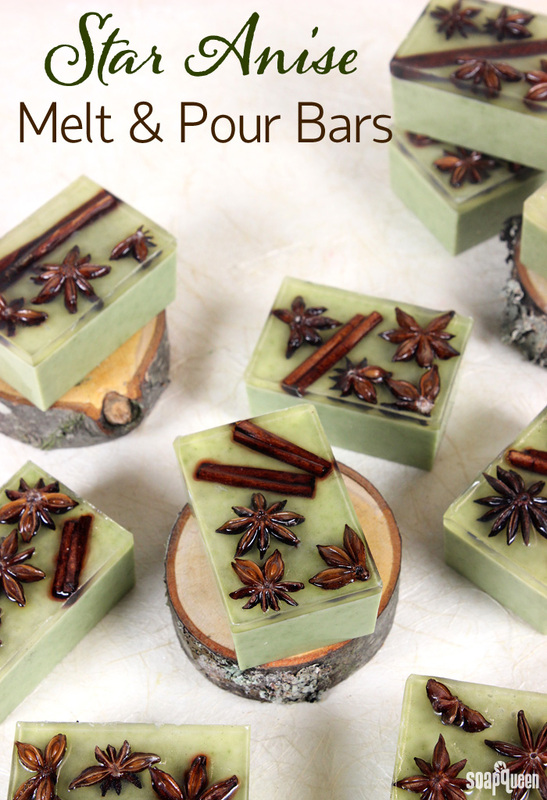 These Star Anise Melt and Pour Bars are made with natural colorants and a blend of orange and anise essential oils for a fresh scent. Chop and melt 50 oz. of Shea Melt and Pour in the microwave using 30 second bursts. Once completely melted, add the fragrance blend and use a spoon or spatula to stir in thoroughly. Add all of the dispersed green zoelite and 1 Tbs. of the dispersed spirulina powder. Thoroughly mix in the colorants until there are no clumps. Check the temperature of the soap. You want the soap to be around 120-130 ° F. If the soap is too hot when it’s poured into the mold, the majority of the clay will sink to the bottom. Pour the melted soap evenly into each mold cavity and spritz the top of the soap with rubbing alcohol to disperse any bubbles. Set the soap aside to allow to cool and harden. 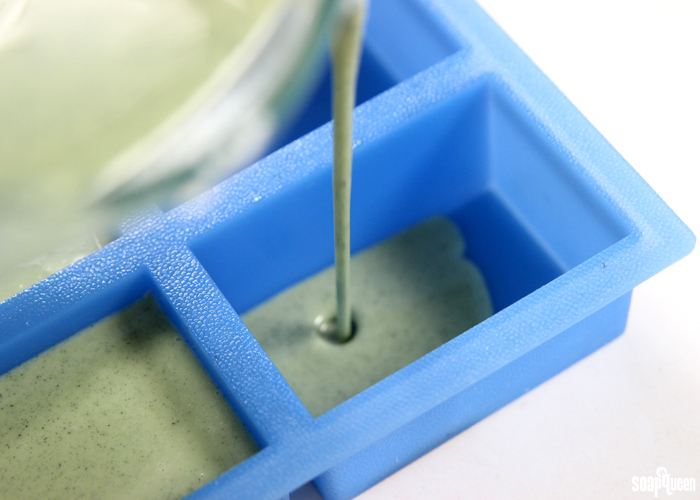 Once the poured green soap has cooled enough to develop a thick skin, chop and melt 13 oz. of Clear Melt and Pour in the microwave using 20 second bursts. 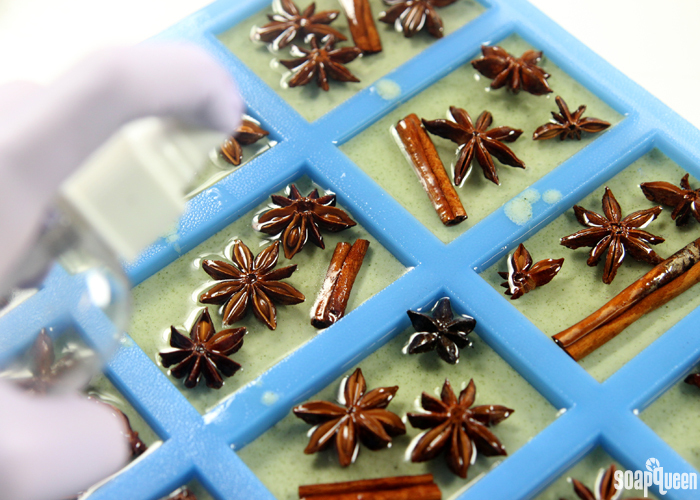 Then, arrange the anise stars and cinnamon sticks on the top of each soap to your preference. Once the clear soap is completely melted and is no hotter than 130 ° F, spritz the top of each soap with rubbing alcohol, and carefully pour a thin layer of clear soap on the top of each mold. 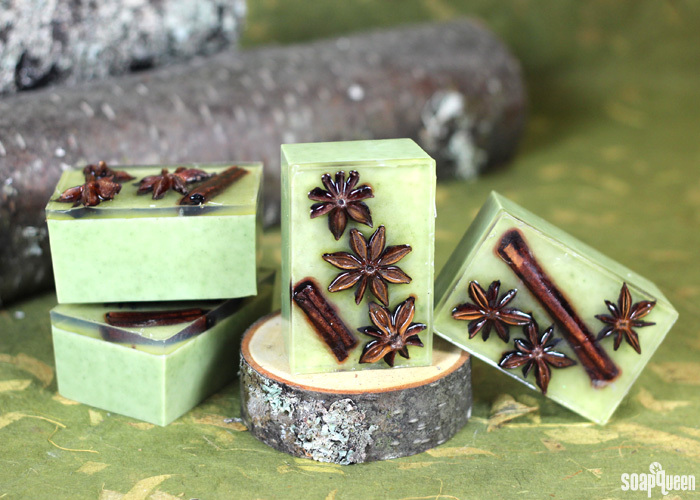 You want the clear soap to just cover the anise stars and cinnamon sticks. Immediately spritz with alcohol to disperse any bubbles. Repeat with all cavities and allow the soap to fully cool and harden. Once hardened, remove from the mold by pulling on the side of each cavity to break the airlock. Then, flip the mold over and press gently on the back of each cavity with your thumb or the palm of your hand until the soap releases. To prevent glycerin dew, wrap each soap in plastic wrap or another airtight container. Wash carefully with each bar, as the anise stars can be a little poky. =) Because of this, you may prefer to use these as hand soap, or wash with the bottom side. I made this soap on Saturday and found the transparent side of the soap started to crystallise around the edges after 4 days. Any idea what may have caused that to happen? Does it have little beads of moisture on it, or does it look like it has a film? We made this wonderful soap-bars as giveaways for the Holidays and it was such a success!!! We barely saved one for ourselves, and everyone was amazed by the deep and rich licorice smell! Love the smell of anise, its intoxicating. I have to try this soap combination. I tried these over the weekend and my top layer didn’t stick to the bottom layer. I used 99% alcohol in between and followed the recipe to a T. Any ideas? SQ, How to deal with the color of the Anise and Cinnamon bleeding through after a month? Any suggestions? I was fairly pleased with my results, enough so that I would like to try again and perfect the method. Right after I poured the top clear coating, The under layer of the green soap started to bubble up into the clear topping. It just kinda clouded up, my Star Anise and cinnamon also floated up but that was not a real issue. I’m guessing I didn’t wait long enough for the green layer to harden or my clear layer was too hot when I poured. For the next batch, we recommend letting the clear soap cool to around 125F. That will prevent the soap below from melting! I am a beginner at soap making and this recipe was VERY easy. The bars came out beautifully. –Seems like I had too much of the first layer (the green one) and not enough of the second layer (the clear one). I’m not sure if I measured incorrectly or if the amounts in the recipe need modification. Thanks for the great recipe. I’m giving them as Christmas gifts and I can’t wait to see everyone’s reaction!!! You’re welcome Jessica, so glad you enjoyed the recipe! With this recipe, we wanted the clear layer to be big enough to gold the star anise in place. If you like, you can definitely make the clear layer a bit bigger! That would look really pretty. I would recommend increasing the clear soap about by 3 ounces or so. These were super easy and smell and look amazing. But I ran into one small issue. Because the stars “float” a bit they come above the clear layer. That isn’t a cosmetic issue. BUT it holds the plastic wrap up just a smudge and darned if they are not sweating where that happens. Is there anything I can do? Does the sweating hurt anything other than being a bit unclear in that area? Next time I will leave more room and push them into the green layer a bit more. But everyone getting them so far has loved them! Hi Kelsey, thanks for the gorgeous soap recipe. 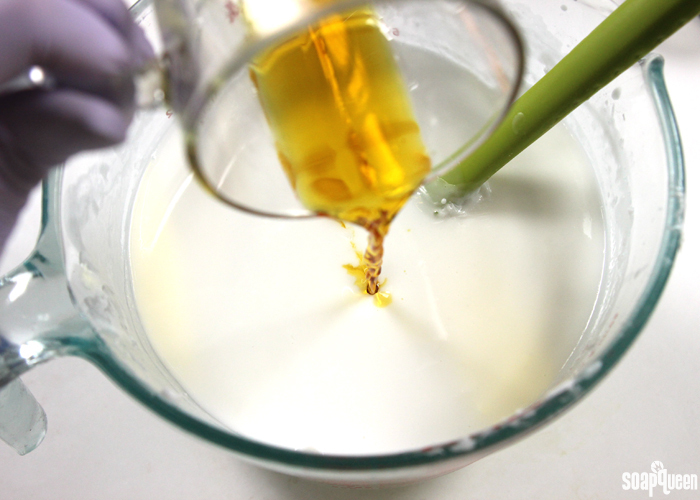 I do have one question – what is your take on mixing Shea rebatch and melt&pour? I was thinking it may create an interesting mix of textures. If you give it a try, let us know how it goes! I’m really curious to see how it works. 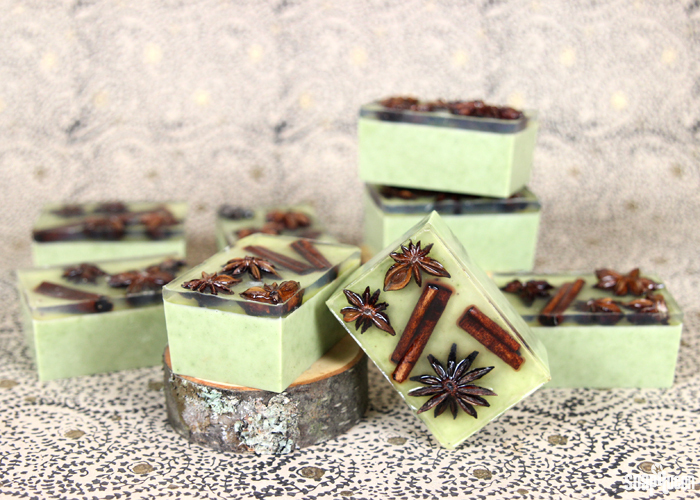 Wouldn’t the star anise and cinnamon hurt when you use the soap?